Awards Announcements, Christmas Hops, and Book Tours, oh my! 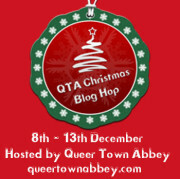 Also on Dec 8th, I’ll be participating in Queer Town Abbey’s Christmas Blog Hop! Everyone will be sharing what Christmas means to them (as well as their favorite Christmas cookie recipe–mine will be sour cream cookies–YUM). 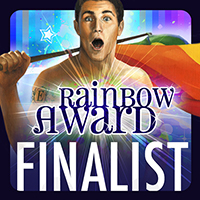 Check out the list of all the fabulous participants and awesome prizes here. You have to see it to believe all the great giveaways that will be taking place! Be sure to come back on Dec 8th to read my post and get my recipe! I guarantee you, it will be worth it! 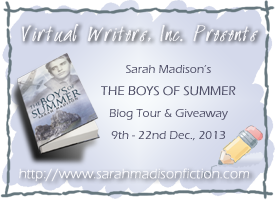 Then, starting on Dec 9th and running through Dec 22nd, I’ve got a book tour with Virtual Writers for The Boys of Summer! Oh man, have we been working at this! I’ve written over eight blog posts, and have been interviewed at least five times! I have my very own book trailer, we’re going to do a live Twitter Chat on Sunday Dec 15th at 1 pm EST, and we’re hosting a giveaway of our own as well–grand prize is a $50 Amazon gift card! That could come in handy right now at Christmas, couldn’t it? 🙂 The official page for the book tour is here. The most important part about all of that is that I NEED YOU to be there too! Come join the fun! I’m going to be posting as part of an international book tour, and though I know I can talk to a wall if necessary (I proved that in the first grade, much to the barely-controlled amusement of my teacher), I would much rather talk with YOU. Chatty Cathy, that’s me! Not to mention, comments left on posts will increase the number of entries you get in the Rafflecopter giveaway! This entry was posted in Uncategorized and tagged awards, blog hop, contests, guest blog, interviews, promo, Sarah Madison, The Boys of Summer by Sarah Madison. Bookmark the permalink. Wow, sounds like quite a busy December! Busy in the best ways, of course. 🙂 Congratulations on being a finalist and good luck, Sarah! Sarah Madison recently posted..Awards Announcements, Christmas Hops, and Book Tours, oh my!